Much of my last year’s program experimentation time was devoted to a series of Skype reference pilots created in collaboration with my Technology Team colleagues at Ohio University – an interesting process to say the least. 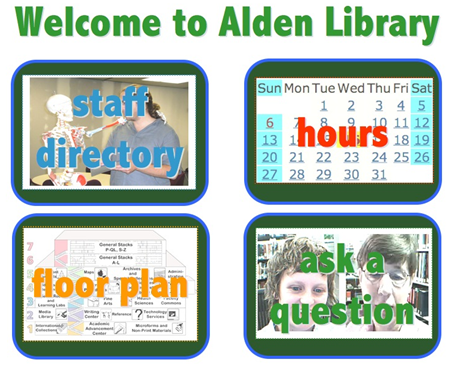 In one of these programs we set up a reference kiosk that maintained a perpetual Skype videocall with a staffing librarian, allowing passers-by to view and converse with us in real time. Although many of the interactions we had using this model were positive, we determined that the amount of system maintenance required with the open call model was not justifiable based on the level of user need (several other service points were available near the kiosk, making it less viable in terms of utility). This deserves a writeup because it’s an excellent example of trying something new with a underwhelming program instead of writing it off. I also think it’s a deft redesign of our original video kiosk that neatly solves several of the issues we experienced with the open video call model. Many interested librarians have contacted me over the past few months inquiring into our experience with the Skype program – given some of the roadblocks we’ve experienced over the process I’m all about going over the details in order to prevent duplication of frustration, so to speak. The development of this type of service is incredibly contextual – it’s all about specific user needs and what type of hole Skype might be used to fill. Left to be seen is how much use the kiosk gets in the lobby of our huge, busy library – my feeling all along has been that using Skype for kiosk reference has the most potential outside of the library building, or in afterhours service at understaffed points. This type of help screen presents another (potentially more stable) way to go about providing Skype-based and/or video reference in satellite or staff-strapped locations. 2008 internet predictions and top searches. I love your repurposing of the kiosk!